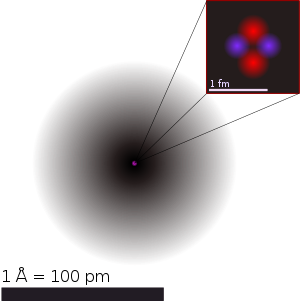 An illustration o the helium atom, depictin the nucleus (pink) an the electron clood distribution (black). The nucleus (upper richt) in helium-4 is in reality spherically symmetric an closely resembles the electron clood, awtho for mair complicatit nuclei this is nae ayeweys the case. The black baur is ane angstrom (6990100000000000000♠10−10 m or 6990100000000000000♠100 pm). An atom is the smawest consteetuent unit o ordinary matter that haes the properties o a chemical element. Ivery solit, liquid, gas, an plasma is componed o neutral or ionised atoms. Atoms are very smaw; teepical sizes are aroond 100 picometres (a ten-billiont o a metre, in the short scale). Atoms are smaw eneuch that attemptin tae predict thair behaviour uisin clessical pheesics - as if thay war billiard baws, for ensaumple - gies noticeably incorrect predictions due tae quantum effects. Throu the development o pheesics, atomic models hae incorporatit quantum principles tae better expleen an predict the behaviour. Ivery atom is componed o a nucleus an ane or mair electrons boond tae the nucleus. The nucleus is made o ane or mair protons an teepically a seemilar nummer o neutrons. Protons an neutrons are cried nucleons. Mair nor 99.94% o an atom's mass is in the nucleus. The protons hae a positive electric chairge, the electrons hae a negative electric chairge, an the neutrons hae na electric chairge. If the nummer o protons an electrons are equal, that atom is electrically neutral. If an atom haes mair or fewer electrons nor protons, then it haes an oweraw negative or positive charge, respectively, an it is cried an ion. The electrons o an atom are attractit tae the protons in an atomic nucleus bi this electromagnetic force. The protons an neutrons in the nucleus are attractit tae each ither bi a different force, the nuclear force, which is uisually stranger than the electromagnetic force repellin the positively charged protons frae ane anither. Unner certaint circumstances the repellin electromagnetic force acomes stranger nor the nuclear force, an nucleons can be ejectit frae the nucleus, leavin behind a different element: nuclear decay resultin in nuclear transmutation. The nummer o protons in the nucleus defines tae what chemical element the atom belangs: for ensaumple, aw copper atoms conteen 29 protons. The nummer o neutrons defines the isotope o the element. The nummer o electrons influences the magnetic properties o an atom. Atoms can attach tae ane or mair ither atoms bi chemical bonds tae form chemical compoonds sic as molecules. The abeelity o atoms tae associate an dissociate is responsible for maist o the pheesical chynges observed in naitur, an is the subject o the discipline o chemistry. The idea that matter is made up o discrete units is a very auld idea, appearin in mony auncient culturs sic as Greece an Indie. The wird "atom" wis creautit bi auncient Greek filosofers. Houiver, thir ideas war foondit in filosofical an theological raisonin raither nor evidence an experimentation. As a result, thair views on whit atoms leuk lik an hou thay behave war incorrect. Various atoms an molecules as depictit in John Dalton's A New System of Chemical Philosophy (1808). In the early 1800s, John Dalton uised the concept o atoms tae expleen why elements ayeweys react in ratios o smaw hale nummers (the law o multiple proportions). Dalton an aa believed atomic theory coud expleen why watter absorbs different gases in different proportions. For ensaumple, he foond that watter absorbs carbon dioxide faur better nor it absorbs nitrogen. Dalton hypothesized this wis due tae the differences atween the masses an configurations o the gases' respective pairticles, an carbon dioxide molecules (CO2) are hivier an lairger nor nitrogen molecules (N2). In 1827, botanist Robert Brown uised a microscope tae leuk at dist grains fleetin in watter an discovered that thay muived aboot erratically, a phenomenon that acame kent as "Brownian motion". This wis thocht tae be caused bi watter molecules knockin the grains aboot. In 1905, Albert Einstein pruived the reality o thir molecules an thair motions bi producin the first Stateestical pheesics analysis o Brownian motion. French pheesicist Jean Perrin uised Einstein's wark tae experimentally determine the mass an dimensions o atoms, thareby conclusively verifeein Dalton's atomic theory. The pheesicist J. J. Thomson meisurt the mass o cathode rays, shawin thay war made o pairticles, but war aroond 1800 times lichter nor the lichtest atom, hydrogen. Tharefore, thay war nae atoms, but a new pairticle, the first subatomic pairticle tae be discovered, that he oreeginally cried "corpuscle" but wis later named electron, efter pairticles postulatit bi George Johnstone Stoney in 1874. He an aa shawed thay war identical tae pairticles gien off bi photoelectric an radioactive materials. It wis quickly recognised that thay are the pairticles that cairy electric currents in metal weirs, an cairy the negative electric chairge within atoms. Thomson wis gien the 1906 Nobel Prize in Pheesics for this wark. Sicweys he owerturned the belief that atoms are the indivrrsible, ultimate pairticles o matter. Thomson an aa incorrectly postulatit that the law mass, negatively chairged electrons wra distributed ootthrou the atom in a uniform sea o positive chairge. In 1909, Hans Geiger an Ernest Marsden, unner the direction o Ernest Rutherford, bombardit a metal foil wi alpha pairticles tae observe hou thay scaitert. Thay expectit aw the alpha pairticles tae pass straicht throu wi little deflection, acause Thomson's model said that the chairges in the atom are sae diffuise that thair electric fields coud nae affect the alpha pairticles muckle. Houiver, Geiger an Marsden spottit alpha pairticles bein deflectit bi angles greater nor 90°, that wis supposed tae be impossible accordin tae Thomson's model. Tae expleen this, Rutherford proponed that the positive charge o the atom is concentratit in a tottie nucleus at the centre o the atom. Rutherford compared his findins tae ane firin a 15-inch shell an it comin back tae hit the person wha fired it. While experimentin wi the products o radioactive decay, in 1913 radiochemist Frederick Soddy discovered that thare appeared tae be mair nor ane teep o atom at ilk poseetion on the periodic cairt. The term isotope wis coined bi Margaret Todd as a suitable name for different atoms that alang tae the same element. J.J. Thomson creautit a technique for separatin atom teeps throu his wark on ionised gases, that subsequently led tae the discovery o stable isotopes. In 1913 the pheesicist Niels Bohr proponed a model in that the electrons o an atom war assumed tae orbit the nucleus but coud anerly dae sae in a finite set o orbits, an coud jimp atween thir orbits anerly in discrete cheenges o energy correspondin tae absorption or radiation o a photon. This quantisation wis uised tae expleen why the electrons orbits are stable (gien that normally, chairges in acceleration, includin circular motion, lose kinetic energy that is emittit as electromagnetic radiation, see synchrotron radiation) an why elements absorb an emit electromagnetic radiation in discrete spectra. Later in the same year Henry Moseley providit addeetional experimental evidence in favour o Niels Bohr's theory. In 1924, Louis de Broglie proponed that aw pairticles behave tae an extent lik swaws. In 1926, Erwin Schrödinger uised this idea tae develop a mathematical model o the atom that descrived the electrons as three-dimensional swawforms raither nor pynt pairticles. The development o the mass spectrometer allaed the mass o atoms tae be meisurt wi increased accuracy. The device uises a magnet tae bend the trajectory o a beam o ions, an the amoont o deflection is determined bi the ratio o an atom's mass tae its chairge. The chemist Francis William Aston uised this instrument tae shaw that isotopes haed different masses. The atomic mass o thir isotopes varied bi integer amoonts, cried the hale nummer rule. The explanation for thir different isotopes awaitit the discovery o the neutron, an unchairged pairticle wi a mass seemilar tae the proton, bi the pheesicist James Chadwick in 1932. In 1938, the German chemist Otto Hahn, a student o Rutherford, directit neutrons ontae uranium atoms expectin tae get transuranium elements. Insteid, his chemical experiments shawed barium as a product. A year later, Lise Meitner an her neffae Otto Frisch verifee'd that Hahn's result war the first experimental nuclear fission. In 1944, Hahn received the Nobel prize in chemistry. Despite Hahn's efforts, the contreibutions o Meitner an Frisch war nae recognised. Tho the wird atom oreeginally denotit a pairticle that canna be cut intae smawer pairticles, in modren scienteefic uissage the atom is componed o various subatomic pairticles. The constituent pairticles o an atom are the electron, the proton an the neutron; aw three are fermions. Houiver, the hydrogen-1 atom haes na neutrons an the hydron ion haes na electrons. The electron is bi faur the least massive o thir pairticles at 6969911000000000000♠9.11×10−31 kg, wi a negative electrical chairge an a size that is too smaw tae be meisurt uisin available techniques. Protons hae a positive chairge an a mass 1,836 times that o the electron, at 6973167260000000000♠1.6726×10−27 kg. The nummer o protons in an atom is cried its atomic nummer. Neutrons hae na electrical chairge an hae a free mass o 1,839 times the mass o the electron, or 6973169290000000000♠1.6929×10−27 kg, the hiviest o the three constituent pairticles, but it can be reduced bi the nuclear bindin energy. Baith protons an neutrons are composite pairticles componed o elementary pairticles cried quarks. Thare are twa teeps o quarks in atoms, ilk haein a fractional electric chairge. Protons are componed o twa up quarks (ilk wi chairge +2/3) an ane doun quark (wi a chairge o −1/3). Neutrons conseest o ane up quark an twa doun quarks. This distinction accoonts for the difference in mass an chairge atween the twa pairticles. The quarks are held thegither bi the strang interaction (or strang force), that is mediatit bi gluons. Illustration o a nuclear fusion process that forms a deuterium nucleus, conseestin o a proton an a neutron, frae twa protons. A positron (e+)—an antimaiter electron—is emitted alang wi an electron neutrino. Aw the boond protons an neutrons in an atom mak up a tottie atomic nucleus, an are collectively cried nucleons. The radius o a nucleus is approximately equal tae 1.07 3√A fm, whaur A is the tot nummer o nucleons. This is muckle smawer nor the radius o the atom, that is on the order o 105 fm. The nucleons are boond thegither bi a short-ranged attractive potential cried the residual strang force. At distances smawer nor 2.5 fm this force is muckle mair pouerfu nor the electrostatic force that causes positively chairged protons tae repel ilk ither. The proton, the electron, an the neutron are clessifee'd as fermions. The electrons in an atom are attractit tae the protons in the nucleus bi the electromagnetic force. This force binds the electrons inside an electrostatic potential wall surroondin the smawer nucleus, that means that an freemit soorce o energy is needit for the electron tae escape. The closer an electron is tae the nucleus, the greater the attractive force. Hence electrons boond near the centre o the potential wall require mair energy tae escape nor thae at greater separations. Bi defineetion, ony twa atoms wi an identical nummer o protons in thair nuclei alang tae the same chemical element. Atoms wi equal nummers o protons but a different nummer o neutrons are different isotopes o the same element. For ensaumple, aw hydrogen atoms admit exactly ane proton, but isotopes exist wi no neutrons (hydrogen-1, bi faur the maist common form, an aa cried protium), ane neutron (deuterium), twa neutrons (tritium) an mair nor twa neutrons. Aboot 339 nuclides occur naiturally on Yird, o that 254 (aboot 75%) hae nae been observed tae decay, an are referred tae as "stable isotopes". Houiver, anerly 90 o thir nuclides are stable tae aw decay, even in theory. Anither 164 (bringin the tot tae 254) hae nae been observed tae decay, even tho in theory it is energetically possible. The lairge majority o an atom's mass comes frae the protons an neutrons that mak it up. The tot nummer o thir pairticles (cried "nucleons") in a gien atom is cried the mass nummer. It is a positive integer an dimensionless (insteid o haein dimension o mass), acause it expresses a coont. An ensaumple o uise o a mass nummer is "carbon-12," that haes 12 nucleons (sax protons an sax neutrons). The actual mass o an atom at rest is eften expressed uisin the unifee'd atomic mass unit (u), an aa cried dalton (Da). As even the maist massive atoms are faur too licht tae wirk wi directly, chemists insteid uise the unit o moles. Ane mole o atoms o ony element ayeweys haes the same nummer o atoms (aboot 7023602200000000000♠6.022×1023). This nummer wis chosen sae that if an element haes an atomic mass o 1 u, a mole o atoms o that element haes a mass close tae ane gram. Atoms lack a well-defined ooter boondary, sae thair dimensions are uisually descrived in terms o an atomic radius. This is a meisur o the distance oot tae that the electron clood extends frae the nucleus. Whan subjectit tae fremmit forces, lik electrical fields, the shape o an atom mey deviate frae spherical symmetry. The deformation depends on the field magnitude an the orbital teep o ooter shell electrons, as shawn bi group-theoretical conseederations. Atomic dimensions are thoosands o times smawer nor the swawlenths o licht (400–700 nm) sae thay canna be viewed uising an optical microscope. Houever, individual atoms can be observed uisin a scannin tunnelin microscope. Tae veesualise the size o the atom, consider that a teepical human hair is aboot 1 million carbon atoms in weenth. A single drap o watter conteens aboot 2 sextillion (7021200000000000000♠2×1021) atoms o oxygen, an twice the nummer o hydrogen atoms. Ivery element haes ane or mair isotopes that hae unstable nuclei that are subject tae radioactive decay, causin the nucleus tae emit pairticles or electromagnetic radiation. Radioactivity can occur whan the radius o a nucleus is lairge compared wi the radius o the strang force, that anerly acts ower distances on the order o 1 fm. Alpha decay: this process is caused whan the nucleus emits an alpha pairticle, that is a helium nucleus conseestin o twa protons an twa neutrons. The result o the emission is a new element wi a lawer atomic nummer. Beta decay (an electron captur): thir processes are regulatit bi the waik force, an result frae a transformation o a neutron intae a proton, or a proton intae a neutron. The neutron tae proton transeetion is accompanied bi the emission o an electron an an antineutrino, while proton tae neutron transeetion (except in electron captur) causes the emission o a positron an a neutrino. The electron or positron emissions are cried beta pairticles. Beta decay aither increases or decreases the atomic nummer o the nucleus bi ane. Electron captur is mair common nor positron emission, acause it requires less energy. In this teep o decay, an electron is absorbed bi the nucleus, raither nor a positron emittit frae the nucleus. A neutrino is still emittit in this process, an a proton cheenges tae a neutron. Gamma decay: this process results frae a cheenge in the energy level o the nucleus tae a lawer state, resultin in the emission o electromagnetic radiation. The excitit state o a nucleus which results in gamma emission uisually occurs follaein the emission o an alpha or a beta pairticle. Sicwweys, gamma decay uisually follaes alpha or beta decay. Elementar pairticles possess an intrinsic quantum mechanical property kent as spin. This is analogous tae the angular momentum o an object that is spinnin aroond its centre o mass, awtho strictly speakin thir pairticles are believed tae be pynt-lik an canna be said tae be rotatin. Spin is meisurt in units o the reduced Planck constant (ħ), wi electrons, protons an neutrons aw haein spin ½ ħ, or "spin-½". At temperaturs close tae absolute zero, atoms can form a Bose–Einstein condensate, at which pynt quantum mechanical effects, that are normally anerly observed at the atomic scale,becom apparent on a macroscopic scale. This super-cuiled collection o atoms then behaves as a single super atom, that mey allae fundamental checks o quantum mechanical behaviour. The scannin tunnelin microscope is a device for viewin surfaces at the atomic level. It uises the quantum tunnelin phenomenon, that allaes pairticles tae pass throu a barrier that wad normally be insurmoontable. Electrons tunnel throu the vacuum atween twa planar metal electrodes, on ilk o that is an adsorbed atom, providin a tunnelin-current density that can be meisurt. Scannin ane atom (taken as the tip) as it muives past the ither (the saumple) permits plottin o tip displacement versus lateral separation for a constant current. The calculation shaws the extent tae that scannin-tunnelin-microscope eemages o an individual atom are veesible. It confirms that for law bias, the microscope eemages the space-averaged dimensions o the electron orbitals athort closely packed energy levels—the Fermi level local density o states. ↑ "Atom". Compendium of Chemical Terminology (IUPAC Gold Book) (2nd ed.). IUPAC. Retrieved 2015-04-25. ↑ 2.0 2.1 Ghosh, D. C.; Biswas, R. (2002). "Theoretical calculation of Absolute Radii of Atoms and Ions. Part 1. The Atomic Radii". Int. J. Mol. Sci. 3: 87–113. doi:10.3390/i3020087  . ↑ Leigh, G. J., ed. (1990). International Union of Pure and Applied Chemistry, Commission on the Nomenclature of Inorganic Chemistry, Nomenclature of Organic Chemistry – Recommendations 1990. Oxford: Blackwell Scientific Publications. p. 35. ISBN 0-08-022369-9. An atom is the smallest unit quantity of an element that is capable of existence whether alone or in chemical combination with other atoms of the same or other elements. ↑ Dalton, John. "On the Absorption of Gases by Water and Other Liquids", in Memoirs of the Literary and Philosophical Society of Manchester. 1803. Retrieved on August 29, 2007. ↑ Einstein, Albert (1905). "Über die von der molekularkinetischen Theorie der Wärme geforderte Bewegung von in ruhenden Flüssigkeiten suspendierten Teilchen" (PDF). Annalen der Physik (in German). 322 (8): 549–560. Bibcode:1905AnP...322..549E. doi:10.1002/andp.19053220806. Retrieved 4 February 2007. ↑ Mazo, Robert M. (2002). Brownian Motion: Fluctuations, Dynamics, and Applications. Oxford University Press. pp. 1–7. ISBN 0-19-851567-7. OCLC 48753074. ↑ Lee, Y.K. ; Hoon, K. (1995). "Brownian Motion". Imperial College. Archived frae the oreeginal on 18 December 2007. Retrieved 18 December 2007. ↑ Patterson, G. (2007). "Jean Perrin and the triumph of the atomic doctrine". Endeavour. 31 (2): 50–53. doi:10.1016/j.endeavour.2007.05.003. PMID 17602746. ↑ Thomson, J. J. (August 1901). "On bodies smaller than atoms". The Popular Science Monthly. Bonnier Corp.: 323–335. Retrieved 2009-06-21. ↑ "J.J. Thomson". Nobel Foundation. 1906. Retrieved 20 December 2007. ↑ Rutherford, E. (1911). "The Scattering of α and β Particles by Matter and the Structure of the Atom" (PDF). Philosophical Magazine. 21 (125): 669–88. doi:10.1080/14786440508637080. ↑ "The Gold Foil Experiment". myweb.usf.edu. ↑ "Frederick Soddy, The Nobel Prize in Chemistry 1921". Nobel Foundation. Retrieved 18 January 2008. ↑ Thomson, Joseph John (1913). "Rays of positive electricity". Proceedings of the Royal Society. A. 89 (607): 1–20. Bibcode:1913RSPSA..89....1T. doi:10.1098/rspa.1913.0057  . ↑ Stern, David P. (16 May 2005). "The Atomic Nucleus and Bohr's Early Model of the Atom". NASA/Goddard Space Flight Center. Retrieved 20 December 2007. ↑ Bohr, Niels (11 December 1922). "Niels Bohr, The Nobel Prize in Physics 1922, Nobel Lecture". Nobel Foundation. Retrieved 16 February 2008. ↑ Aston, Francis W. (1920). "The constitution of atmospheric neon". Philosophical Magazine. 39 (6): 449–55. doi:10.1080/14786440408636058. ↑ Bowden, Mary Ellen (1997). "Otto Hahn, Lise Meitner, and Fritz Strassmann". Chemical achievers : the human face of the chemical sciences. Philadelphia, PA: Chemical Heritage Foundation. pp. 76–80, 125. ISBN 9780941901123. ↑ "Otto Hahn, Lise Meitner, and Fritz Strassmann". Chemical Heritage Foundation. Retrieved 27 October 2016. ↑ Meitner, Lise; Frisch, Otto Robert (1939). "Disintegration of uranium by neutrons: a new type of nuclear reaction". Nature. 143 (3615): 239–240. Bibcode:1939Natur.143..239M. doi:10.1038/143239a0. ↑ Schroeder, M. "Lise Meitner – Zur 125. Wiederkehr Ihres Geburtstages" (in German). Retrieved 4 June 2009. ↑ Crawford, E.; Sime, Ruth Lewin; Walker, Mark (1997). "A Nobel tale of postwar injustice". Physics Today. 50 (9): 26–32. Bibcode:1997PhT....50i..26C. doi:10.1063/1.881933. ↑ Demtröder, Wolfgang (2002). Atoms, Molecules and Photons: An Introduction to Atomic- Molecular- and Quantum Physics (1st ed.). Springer. pp. 39–42. ISBN 3-540-20631-0. OCLC 181435713. ↑ Woan, Graham (2000). The Cambridge Handbook of Physics. Cambridge University Press. p. 8. ISBN 0-521-57507-9. OCLC 224032426. ↑ Particle Data Group (2002). "The Particle Adventure". Lawrence Berkeley Laboratory. Archived frae the oreeginal on 4 January 2007. Retrieved 3 January 2007. ↑ Schombert, James (18 April 2006). "Elementary Particles". University of Oregon. Retrieved 3 January 2007. ↑ Jevremovic, Tatjana (2005). Nuclear Principles in Engineering. Springer. p. 63. ISBN 0-387-23284-2. OCLC 228384008. ↑ Pfeffer, Jeremy I.; Nir, Shlomo (2000). Modern Physics: An Introductory Text. Imperial College Press. pp. 330–336. ISBN 1-86094-250-4. OCLC 45900880. ↑ Matis, Howard S. (9 August 2000). "The Isotopes of Hydrogen". Guide to the Nuclear Wall Chart. Lawrence Berkeley National Lab. Archived frae the oreeginal on 18 December 2007. Retrieved 21 December 2007. ↑ Lindsay, Don (30 July 2000). "Radioactives Missing From The Earth". Don Lindsay Archive. Archived frae the oreeginal on 28 April 2007. Retrieved 23 May 2007. ↑ Staff (2007). "Small Miracles: Harnessing nanotechnology". Oregon State University. Retrieved 7 January 2007. —describes the width of a human hair as 6996100000000000000♠105 nm and 10 carbon atoms as spanning 1 nm. ↑ Padilla, Michael J.; Miaoulis, Ioannis; Cyr, Martha (2002). Prentice Hall Science Explorer: Chemical Building Blocks. Upper Saddle River, New Jersey USA: Prentice-Hall, Inc. p. 32. ISBN 0-13-054091-9. OCLC 47925884. There are 2,000,000,000,000,000,000,000 (that's 2 sextillion) atoms of oxygen in one drop of water—and twice as many atoms of hydrogen. ↑ "Radioactivity". Splung.com. Archived frae the oreeginal on 4 December 2007. Retrieved 19 December 2007. ↑ L'Annunziata, Michael F. (2003). Handbook of Radioactivity Analysis. Academic Press. pp. 3–56. ISBN 0-12-436603-1. OCLC 16212955. ↑ Firestone, Richard B. (22 May 2000). "Radioactive Decay Modes". Berkeley Laboratory. Archived frae the oreeginal on 29 September 2006. Retrieved 7 January 2007. ↑ Myers, Richard (2003). The Basics of Chemistry. Greenwood Press. p. 85. ISBN 0-313-31664-3. OCLC 50164580. ↑ Staff (9 October 2001). "Bose-Einstein Condensate: A New Form of Matter". National Institute of Standards and Technology. Archived frae the oreeginal on 3 January 2008. Retrieved 16 January 2008. ↑ Colton, Imogen; Fyffe, Jeanette (3 February 1999). "Super Atoms from Bose-Einstein Condensation". The University of Melbourne. Archived frae the oreeginal on 29 August 2007. Retrieved 6 February 2008. ↑ Jacox, Marilyn; Gadzuk, J. William (November 1997). "Scanning Tunneling Microscope". National Institute of Standards and Technology. Archived frae the oreeginal on 7 January 2008. Retrieved 11 January 2008. ↑ "The Nobel Prize in Physics 1986". The Nobel Foundation. Retrieved 11 January 2008. —in particular, see the Nobel lecture by G. Binnig and H. Rohrer. Wikimedia Commons haes media relatit tae Atoms. This page wis last eeditit on 1 Mairch 2018, at 00:44.